Discussion in 'Our Music' started by Recoil, Nov 5, 2018.
very coool love the retro sci-fi mood ! Nice song, thanks for the share! 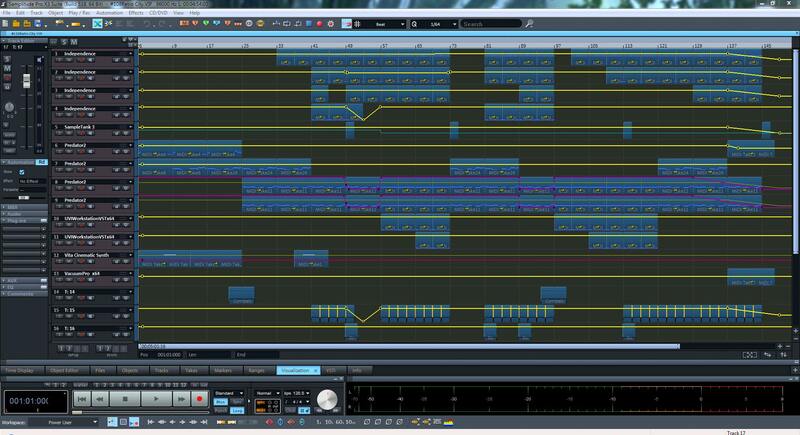 And this is how the whole project looks like, there is no Kontakt 6 I'm proud of that. ..What??! No contact?? You must be from the fewtcha , Love it! Nice one! Can't help thinking 'what series was this from, or what game ?'. Great song @Recoil ... Love those sounds... And the song progresses with so many different things... Awesome! This track can also work as stems/cues for a gaming soundtrack,job well done & thanks for sharing ! Still not quite sure on the ADSR "swells" in the intro but they're pretty unique. It flows and changes rly well, you can predict where it's going and the recognition of the song doing what you expect is :D pleasing! (I guess I've listened to too much Synthwave!) Great job. I think the kick maybe needs to be a bit more gatedish & less thumpy, to fit in w/ the rest of the perc? Maybe. But it's a great journey, you get into it! Brother, I do, and just have, LOL. The poem that I posted was my immediate impression, a reflex on your music as well as the graphic you chose to associate with it in the video, so thank you very much for the fodder to explore a bit deeper, to find those spaces in between the notes where passion and those pussycats live. I love cats and have had some GREAT ones. i guess i can say....we thank you too mate..